For a short time in the 1940s, Shalimar was launched in Guerlain's original squatty rectangular bottle with the mushroom stopper, called the bouchon quadrilobe, manufactured by Baccarat. The bottle came housed in a green box with Art Nouveau like gilded designs of stylized lotus flowers. 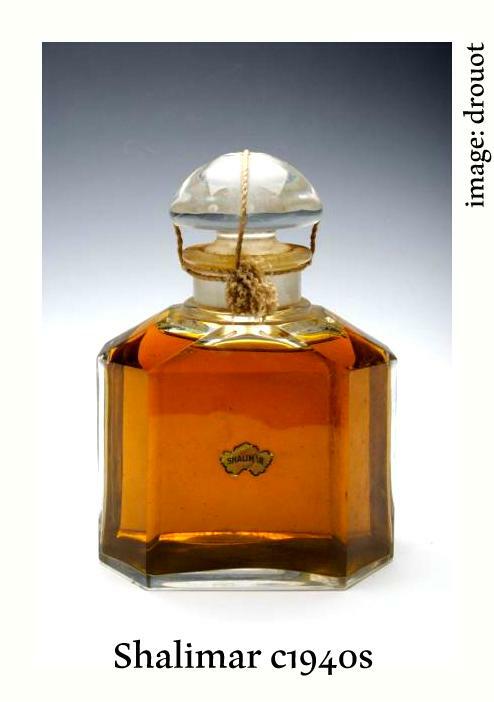 Flacon quadrilobe was made by various manufacturers such as Baccarat, Pochet et du Courval and Cristalleries de Nancy to hold extraits for various perfumes. Some later bottles hold eaux de toilette or eaux de parfum. The labels are the standard Shalimar style. Guerlain may have released special editions over the years in different sizes, compare your bottle to the measurements and dates below to accurately date your bottle. Beat the Heat Guerlain Style!